This harness is manufactured by Manmat and is the hound harness style. 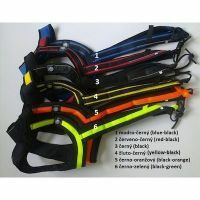 Jana Henychova has been helping to develop this style of harness for broad chested Siberian Huskies for long distance races or intense workouts. This harness is designed to reduce the loss of hair around the neck, and areas that come into contact with the harness. 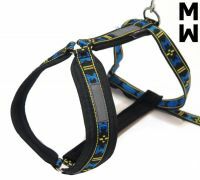 This harness has two parallel straps down the front of the chest which provide better traction for the harness on the dog, reducing the amount of rotation or tortion of the harness that is possible when in use. Made out of 2.5cm wide light weight, extremely durable tubular webbing. Padding is made out of light weight foam covered in a rip-stop shell. Padding extends along the harness's entire length for avoiding injuries due to friction. For the size, only the girth of neck is measured.